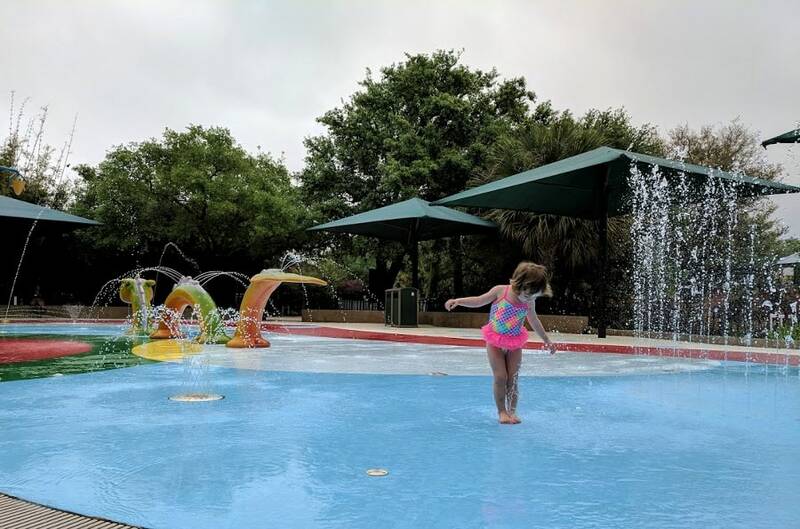 Home»All»The Houston Zoo’s Kathrine McGovern Water Play Park is Open for the Season! 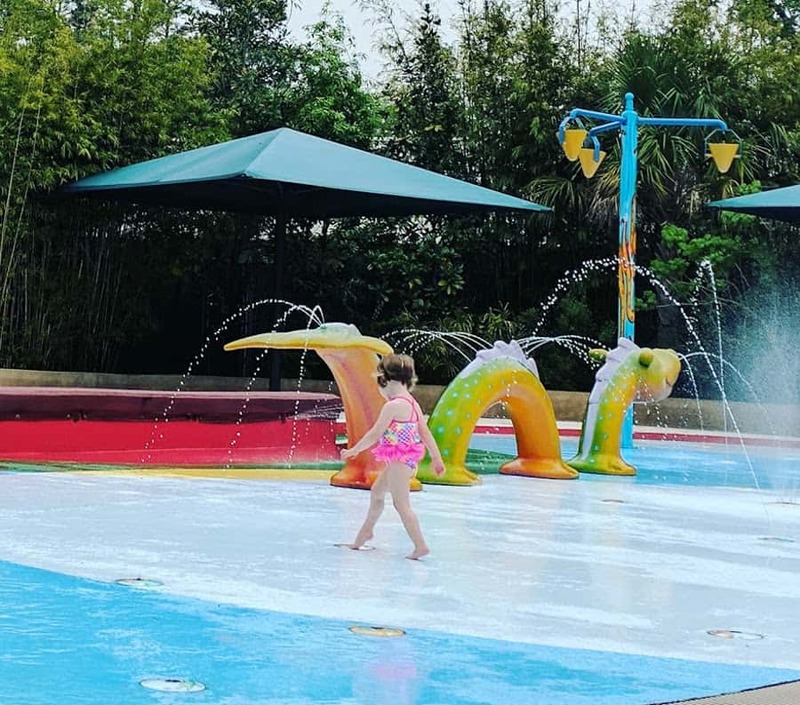 We’ve had the swimsuit in my purse all week… just waiting for a warm up… and now the Kathrine McGovern Water Play Park at the Houston Zoo is open for the season! From April 1 through September 23, the splashpad is open daily from 10:00am to 6:00pm (as long as it’s over 70 degrees). 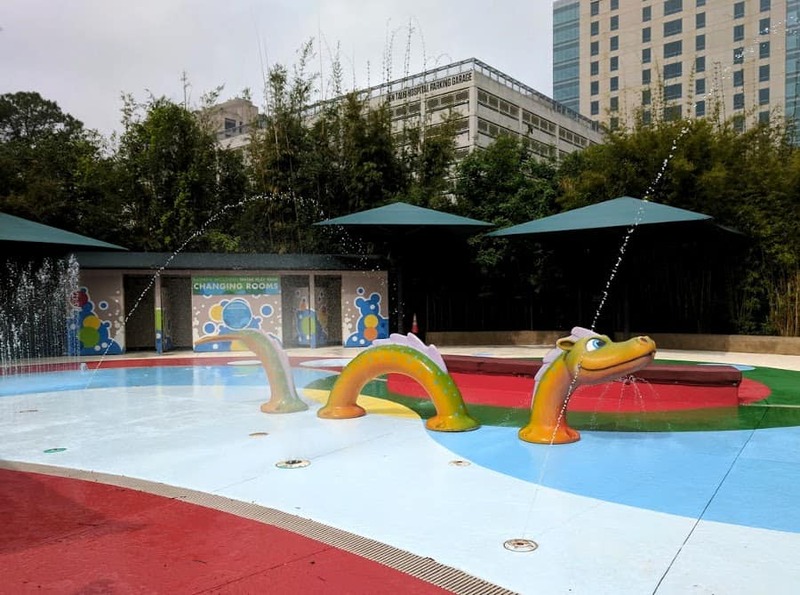 It’s not the biggest splashpad in town, but with our frequent trips to the zoo and the hot Houston weather, we really look forward to stopping by the dragon water play park. The splashpad is free with zoo admission and is located near the giraffes and Wildlife Carousel. It *usually* not too crowded because the tour groups don’t usually bring swim suits and the visitors are eager to see the animals. There are buckets, a water tree, jets, a sea serpent and changing rooms. Also, the splashpad got a fresh coat of paint over the winter… so it’s looking good! There is (some) shaded seating for parents and a lifeguard on duty to keep kids from running, pushing or being too crazy. The area is also closed off from the rest of the zoo, with just one entrance, so kids are mostly contained to the area. Restrooms are around the corner by the giraffes. You do need to have on swimsuits and swim diapers. You can also buy them there, for about $20 for a suit and $5 for a swim diaper. Zoo members can easily drop by from just a splash. If you are buying tickets for the zoo, get your money’s worth by visiting the animals in between splashes. Outside food is allowed into the zoo, so you can make a day of watching animals, splashing and setting up a picnic. You can also stop by the new Wild! Nature Play Area!